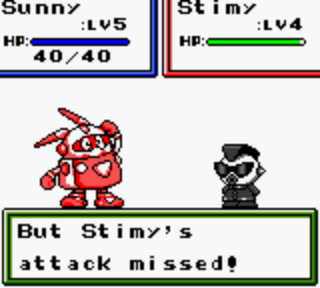 Many Pokémon clones copy the elemental weaknesses of the original game. This is sort of a rock/paper/scissor like system where you have element X who is strong to Y, but weak to Z. Finding the perfect X attacker adds individuality to your party, and there’s a basic strategy in picking a balanced party to handle the AI opponents. Of course, the actual first Pokémon games had broken difficulty. Psychic was supposed to be weak to ghost, however, ghosts were programmed to be weak to psychic due to a bug. As a result, you could finish the entire game using a high levelled psychic monster. In sequels and later games, the difficulty was shaken up a little. For example, a bird themed gym could be killed with a lightning type monster, or a rock type monster. However, one of the monsters used by the head of the gym has earthquake which is a critical hit for lightning monsters. Unsurprisingly, if you don’t know about this monster, you’ll be surprised and you’ll quite likely have to reset the game if your party was depending on a lightning monster. This means that most Pokémon clones are a pain to play in a foriegn language. Usually, there’s no awkward Japanese language puzzles or difficult fetch quests. However, if you can’t understand the rock / paper / scissors system in the game, the entire game becomes blind guesses and random wild success and random horrible failure. For example, the affinities in Telefang are rock weak to grass, grass weak to sand, plant weak to sky, water weak to forest, sky weak to rock, sand weak to water. The "catching a monster" sequence in Telefang involves gaining a monster's phone number. Shin Megami Tensei games have elemental affinities. If you’re hit by a weakness, you tend to lose turns as well as take critical damage. This means that you’re strongly encouraged to take advantage of enemy weaknesses and you’re encouraged to change up your party to try to get better resistances and to attack weaknesses. Final Fantasy also has elemental affinities, however, the game series doesn’t tend to punish weaknesses as badly as the Shin Megami Tensei series. However, you still get the excitement of getting a ice sword and so on. Off the top of my head, I can think of three Pokémon clones / similar games on the Gameboy. There’s Dragon Quest Monsters (basically, Dragon Quest monsters from the series, and a collection / breeding / battling aspect.) You gain new monsters via feeding them meat. Telefang has a pirate English translation and people attempted to pass it off as a Pokémon game. You gain new monsters via getting their phone numbers and then can call them up to assist you. Robopon is yet another clone which uses robots instead of monsters. This early fight in Robopon shows how much the game tries to use the colors on the Gameboy Color. So – advantages of these systems? You have a large cast of monsters and you can make a varied team. The low difficulty level means that you can pick monsters based on their look more than making a perfect team for most of the game. Taking advantages of weaknesses creates a quick feedback loop. Since the element values tend to be invisible in the games, you have to remember, say, that the mouse is weak to fighting, and then you get the instant “you’ve got a critical hit” feedback. A party of monsters in Dragon Warrior Monsters. This also instantly points to a weakness. If you can’t remember weaknesses, or if they’re too numerous or too annoying to memorize, then you won’t get as much joy from the feedback. If you can’t change your team easily, it becomes annoying to deal with challenges. If your monsters are instantly replaceable with a “new” monster with no ties to the old one, you lose that connection with the monster as a team member. Since most of the games have “versions,” you cannot make a full stable of monsters without trading. This means that if one game has a poor enemy set, you will have a much more difficult time in the game.